There are two passions in my life that truly makes me one happy woman: local music and craft beer. On Saturday, December 5th, 2015, I had the awesome opportunity to combine both of my loves and enjoy a great night. The Mississippi Stranglers is a Chicagoland base band located in the good old town of McHenry, Illinois. 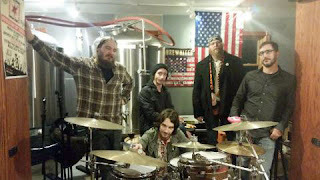 The band was releasing their anticipated EP "The Great Revival" that night at McHenry's first brewery, Chain O'Lakes Brewery. The Mississippi Stranglers consists of some talented, genuine musicians who brings a sound of gritty folk and progressive rock to their fans. Heading the line up is Kurt Carlson (Guitars/ Vocals), Neal "Boomer" Ernst (Guitar/ Vocals), Garrett Pederson (Guitar/ Vocals), David Young (Bass/Mandolin/Keys) and Matt Ford (Drums). That night at Chain O'Lakes Brewery, the boys were ready to bring their original songs of sonic Americana front and center. I have been a fan of The Mississippi Stranglers for about 2 years. What I love about their music is how pure it is to listen to. Some of my favorite songs are "Omaha, " "The Great Revival," and "American Lemonade." After The Mississippi Stranglers rocked out the tap room and had their audience wanting more from the energetic performance, I had the pleasure of sitting down with the band and ask them a few questions. I wanted to get to know more about the history of the band and what is in store for the upcoming 2016 year. Unrated: So great night tonight guys. So, give me a brief history on the band? Kurt Carlson: "Actually, Paul Ernst, Neal Ernst and I started a band about 6 years ago. I moved here from California. We had some members come in and out. Now, we had a couple of great drummers that have been in and out. Since Matt Ford has joined the band, it really has taken a new avenue. The history of the band is rich. The future is even richer at this point." Unrated: Kurt, what made you come from California to Illinois than? Kurt: "Life and some circumstances. I actually called Paul and said, "Hey, we are going to start a band called The Mississippi Stranglers and we did." Unrated: How is Paul relevant to the band? Kurt: "He wrote a lot of the earlier material. He played harp and sang on two albums we did. A lot of things changed in life and we made the best of it." Unrated: You guys really impressed with your songs and your performances. So, is this the first album with this lineup? Kurt: "Yes, with this lineup this is our first album together. We have three prior: "Gotta Fix It." An EP we produced with Pete Downs at Have a Sandwich Records. We self produced a single EP called "American Lemonade" that had wonderful sound with Dave Young playing keyboards. We did an album with a drummer named Tracey Deach called "Black Partridge." Which was a lot of fun. I enjoyed the hell out of it and Paul was on that record. Things changed and enter stage right Matt Ford. And a whole new writing and creative process. Garrett, Neal and Dave and myself have really bonded around Matt. Us having Matt Ford is almost like going downstairs to the Christmas tree looking for something really cool. It was Matt!!!! It was like our Barbie condo or GI Joe. We are pretty lucky. To live in a town like McHenry, to have a studio in McHenry on the river and than making blue collar music for the people, by the people is probably one of the most fulfilling ventures a human being can be apart of right now." Unrated: With the whole drummer situation, it kind of reminded me of the Red Hot Chili Peppers and their situation with their guitarist, what made you decide Matt was the right fit for the band? Kurt: "Matt kind of came into the fold. He had conversations with Garrett like band records." Matt: "I was around basically and it was easy. There were not that many people around so I was another guy in the fold that knew music." Kurt: "We are easy to get along with." Matt: "They were just a town away." Kurt: "When Dave is playing the mandolin on our acoustic stuff, it is great. Dave produces and mixes some of the record and its really a group effort. Its homegrown and its grass roots. " Unrated: What are your favorite songs to play? Neal: "You will have to come back to me and let me think about it." Kurt: "I would say a song I like to play that a lot of people don't get to hear is one that Paul wrote. It is really sleazy called "Pinch and a Lick." With this lineup, something about playing "House on the River" I see it in people's eyes." Matt: "I agree. "Pinch and a Lick." It's a drummer's song." Garrett: "I'm going to go with "Magic." Unrated: I have seen you guys at a lot of breweries or places that serve craft beer: Macky's, Scorched Earth Brewery, Chill Fest and Chain O'Lakes Brewery. So, what is your favorite craft beer? Garrett: "I like the 3 Floyd's Jinx Proof. I also love the Koval from Chain O'Lakes Brewery. That's where it is at." Neal: "This is easy: The Colonel's Scotch Ale. There is nothing like it." Kurt: "When I am playing, I love the Scotch Ale. Curt Ames, the family and the folks that work here at Chain O'Lakes Brewery the history runs deep with this place." Matt: "Me and my dad like the Blue Moon." Unrated: You guys are playing Scorched Earth Brewery next Saturday, December 12th, right? Garrett: "Yes, they have some great, evil beers as well." Unrated: All I have to say about this astounding, true to rock band is I can see them play over and over again. I truly respect the hell out of these guys and what they bring to the local music scene. The Mississippi Stranglers is what is needed now in today's society of overproduced garbage. The Stranglers keeps rock true and has an unnerving sound that will get anyone to appreciate the art that is behind the latest EP "The Great Revival." Well, now that you have got to know The Mississippi Stranglers better, make sure you check them out on Facebook and Revernation page. Check them out at Scorched Earth Brewery in Algonquin, Illinois on December 12th. Their album "The Great Revival" is available and would make a great gift for that music fan in your life. Thanks to The Mississippi Stranglers for their time and #Cheers to what the next year will bring to you.